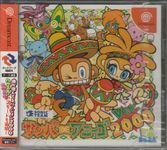 A sequel to the well regarded Dreamcast version of Samba De Amigo, this hastily released game featured an expanded set of music & mini-games, with one major new move added. The new "Hustle" move made players wave their maracas in sequence with the onscreen characters, with this mode being an optional addition, allowing players to play with just the base moves/mechanics for all songs. Additionally, Sega released a number of songs for unlock through a website accessible in-game.